It is one of those rare envelopes that can be used when a peek alone is not enough, e.g. when you need to hand out everything immediately and even have the audience themselves tear their envelope open afterwards. Completely invisible and devious peek! Clear and concise step-by-step instructions with many photos! 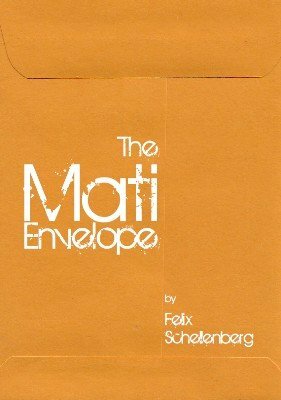 Throughout mentalism history, there have been a lot of different gimmicked envelopes--slit, window, Shaxon, impression, etc.--all designed to secretly learn what the spectator has written. Obviously, this comes in handy in not only direct mind reading routines, but also design duplications, Q&A's, and more elaborate routines such as Cassidy's 4th Dimensional Telepathy and Name and Place. Imagine if you will, an envelope that allows you to learn the information while the envelope, which is normal looking (in the interest of full disclosure, "looking" is the operative word here, friends), remains in the spectator's hand. With his writing inside. Sealed. And you can get your peek of the information in the next room. And unless the spectator knows exactly what to look for, he's going to be able to look at the envelope and see nothing. How is that possible, you ask. Well, I'm dying to tell you about the Mati Envelope, but Jiminy Cricket says let your conscience be your guide so I can't. And even if I did, this review would get edited. So this secret--and oh my, it's a good one--comes at a price, a really reasonable one, I think. How hard is it to make? It's not complicated at all, but you'll need to get some supplies at your office supply store and most likely order one essential item from Amazon. Don't fret. It's not something weird that's going to scream "gimmick." It's an ordinary object on the outside with a different composition than usual on the inside. It will pass completely undetected as ordinary. The comprehensive ebook gives good instructions, and it doesn't take long, but truth be told, I had to stop and reorient my thinking to get back on the right track. But once I did that, I quickly made up a stack of about a dozen envelopes. When all is done, you will have a utility envelope that is far beyond anything that you've seen. Looking over comments on the various magic websites, I'm struck by how little commentary there is about the Mati Envelope. This thing is revolutionary actually, and I would have thought that more people would be raving about it. But they aren't (maybe it's the fear of the unknown or the DIY aspect)--which is good for those of us who get it and use it. I see a lot of things, many of which are excellent and useful, but this is at the highest echelon of the gimmicked envelope field. Now some are going to say that they use a slit/window/Shaxon/impression envelope, and it works just fine. My response is "great," whatever works for you. Maybe you don't need an envelope that--unless someone scrutinizes it super closely before it is finally torn open--allows you to end totally clean, something that you can't do with the others. But this innovation is so devious and seductive, it would be hard to turn away from it once you read about it. It's that good.